Unless you can’t tolerate dairy products. Dairy reactions seem to be a problem for our “Tough Case” readers. In that case, they try making 24-hour goat’s milk yogurt, but it usually triggers the same reaction. The casein protein is a common intolerance for people with Leaky Gut Syndrome. You can either take them in pill form, which is OK but the best place to get good bugs is straight from a food source, like raw unpasteurized sauerkraut. Remember: store bought sauerkraut is usually pasteurized, meaning they heat it up to kill the germs… which also kills the good bugs we’re trying to eat. You’ll need one head of cabbage, a heavy knife, sea salt, a glass bowl, a Ziploc® baggy, and another bowl small enough to fit inside the opening of the glass bowl. Cut the stem off the cabbage. Then, take the head and slice it in half so that you can see the area of the stem that’s left inside the head. Make a V-cut into each half to remove the stem on each side. 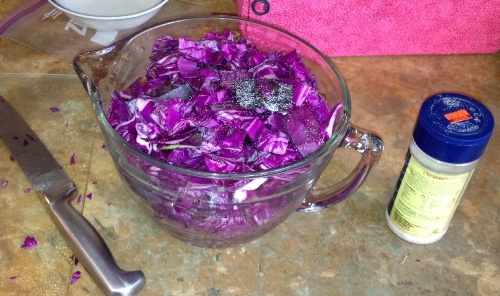 Take the 1st quarter of the cabbage you finely chopped up and drop it into your glass container… but here’s the trick… add the shredded cabbage in a handful at a time, sprinkling sea salt on each handful after you drop it in. Next, go through the other 3 quarters and do the same process until the entire head is chopped and in the glass container with salt gently applied to each handful. 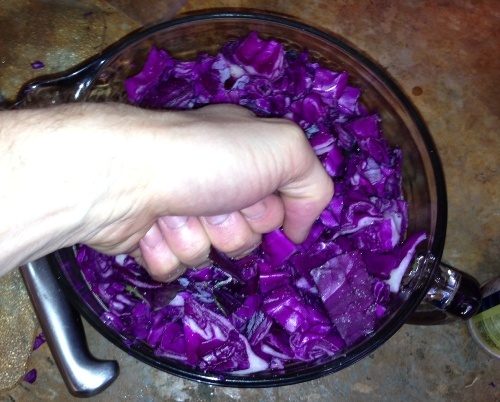 Take a few minutes to use your fist (or a meat hammer – but be careful not to break stuff) to pound on the shredded cabbage in the glass container to begin the process of compacting it. Once it’s packed down a bit, sprinkle a little more salt on it and let it sit for 2-3 hours. Hopefully your shredded cabbage is filled with juice by now. It’s called the “brine.” If not, sometimes I have to actually use both hands and “kneed” the shredded cabbage depending on how ripe it was when I started making it. Take the smaller bowl, which is small enough to fit inside the glass bowl, and set it on top of the sauerkraut. Then, take the Ziploc® baggy and fill it with room temperature water. Set the bag on top of the small bowl… and wallah – it’s done! NOTE: Don’t ever just add regular water to this. If you absolutely have to add water to it to fill it up, then get some filtered water and mix sea salt in it first, then add it. If you still have an old batch in the fridge, add a bit of that brine as a “starter culture” and it will kick it off with some good bugs right off the bat. If it’s ready to go just set it aside somewhere away from too much heat or too much cold. Room temperature is the best. I’ve heard mixed reports about covering it from light and I’m not sure what the difference is, so I still throw a towel over it to keep it in the dark anyways. How long it will take to ferment depends on the temperature of the room it’s in. I usually start tasting mine around day 5 to see where it’s at, but 7 days is typically the best length of time for me when my house stays around 72°F. Just use a spoon and skim that part off into the trash. Anything that was below the brine is healthy and chocked full of good gut bugs. It has wonderful probiotic effects, especially if you can’t tolerate dairy and don’t eat the 24-hour yogurt. If you’re sensitive to good bugs it might be a good idea to start with 1/2 tablespoon each day and work your way up slowly. NOTE: The point of this post was to show you how to make sauerkraut using stuff you may already have in your kitchen. Patrick on Facebook told me about this Picklemeister, which is a cool contraption that makes it easier to ferment sauerkraut by letting gas out of the jar, but not allowing fresh oxygen in. I love pink sauerkraut! 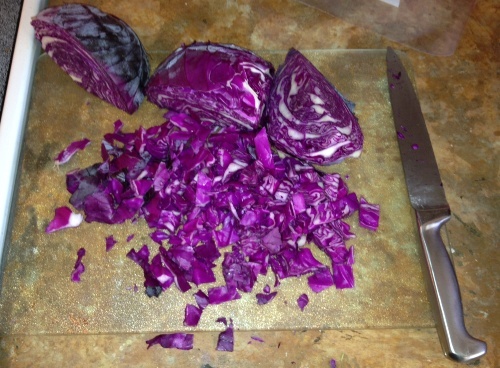 Can’t wait to try making sauerkraut at home with red cabbage – the color is absolutely stunning. Thank you for your recipe and including pictures as well. I’ll report back with how it turns out! Please do, Billy! Thanks for sharing, have a great day! Hi thanks so much for your recipe. How long will it keep for? All that mold? I really don’t think you should be eating that. I’ve been fermenting for a few years and what you show in the above picture is unfortunately no longer fit for consumption in my opinion. Your cabbage was not completely under the brine, so air got on it and then the mold formed. And somewhere in there she says that she looked at the brine of a moldy batch and found mold spores not only on top of the brine but also on the bottom. One thing I found is that is is better to use a mandoline for the cabbage and to cut long thin strips. 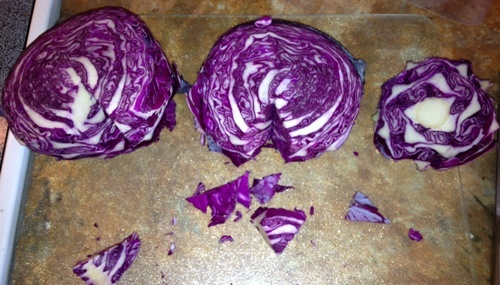 They are much easier to control and push under the brine than food processor cabbage pieces. Hi, I just wanted to comment on a really easy way to ferment the sauerkraut. It uses a lock top FIDO type glass jar. You don’t need to worry about submerging the cabbage because the fermenting anaerobic bacteria gives off a lot of CO2 gas, and forces any air out. The lock top doesn’t allow any air in, but lets excess gas escape. Kinda neat. No mold. But put it in a bowl to catch any drips that come out with the gas if it’s filled full! You can also use a little less salt. 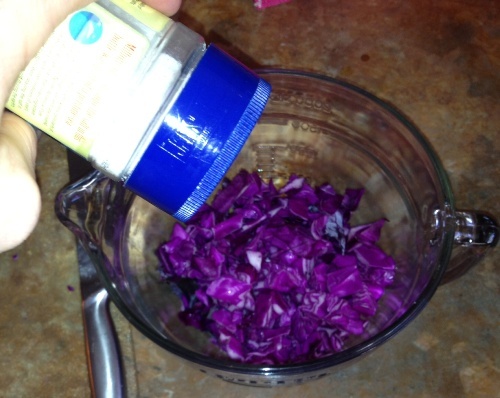 If you squish your shredded cabbage with your clean hands until it is juicy, it won’t take a lot to make a good brine. We used to ferment big crocks of whole cabbage heads in the fall, and these were weighed down to keep them under the surface. The “bloom” (mold) was skimmed off every week and the brine was stirred. The old Germans in the family always used this brine raw as a tonic. I think it was a laxative tonic. Just saying. Hi! Thanks for this informative post. Do you know if there are naturally occurring sulfites in saurkraut? I’ve been trying to google it, but every article just says “saurkraut contains sulfites” but nothing about the homemade stuff. 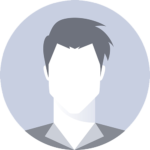 Hi Donna, thank you for reaching out! I am not aware of the answer here either, but it probably depends on many conditions that the fermentation takes place in. Help! We started a crock of sour kraut yesturday and our crock sprung a leak. Can we save the cabbage and use what juice is left? Or start over with the salts as it hasn’t even been a whole day yet!? Hi Jackie, thanks for reaching out! It should be fine to go ahead and use the juice that is left. In the end, as always with fermenting, it is your nose that will be the judge. Everything I have read says that sauerkraut naturally contains bifido bacterias. I thought we were supposed to avoid all things bifido on SCD? I know Elaine said sauerkraut was ok and that many people have used it effectively. I’m just trying to balance all of the info and rules. Thanks for reaching out! Some people are unable to tolerate it, but we suggest testing sauerkraut by adding it in very slowly and if you have problems come back to it in a few months. WHATDO YOU THINK ABOUT BRAGGS ORGANIC APPLE CIDAR VINEGAR , DOES ITHAVE PROBIOTICS AND COULD THAT BE HELPFUL ? Bought a red cabbage today. I shredded it in the food processor, layered it with real salt and mashed it down. I`m using my slow cooker as that was the only big container I had that wasn`t plastic. I`m looking forward to tasting in about a week. What Phase do you recommend adding Sauerkraut? Cabbage is Phase 3 In ‘Surviving to Thriving’ book; is this when you’d add Sauerkraut or could it be earlier if you think you can’t tolerate SCD yogurt? I think it could be very early maybe in the first month. So give it shot! After the 5-7 days of fermentation you put it into a glass container…do you keep the brine with it or just keep the cabbage? And how many time can I conserve it in the fridge? Thanks – will give it a go… I’m guessing while there might be extra fibre to deal with, the overall amount of bacteria in a strand would be less than say half a teaspoon of brine. Wow, just started on the Sauerkraut and… next BM was liquid. I was doing so well up until this point. I was on only half a TBSP per day for two days too. I could feel the benefits, but it just didn’t agree with my gut – and that was just the brine. Is there any hope of me using this probiotic? Is this even a normal reaction for such a tiny amount of brine? Worried I’ll never be able to use probiotics! For the minority they are this sensitive, Jordan had to start with like one or 2 strands a day. Try a very small amt for the next 3 days. If BM’s don’t firm up then move on to pills for now. I have just discovered i have leaky gut. Never had saurkraut but your recipe looks real easy so will try it. Will saurkraut probiotics be sufficient or will I need more please? If so what other foods can I eat? Many thanks for making it easy and doable. I use a Pickl-it to make fermented veggies. It is faster (my kraut ferments on the counter in 2-3 days), and more consistent (it has an airlock, so oxygen stays out and prevents spoilage). 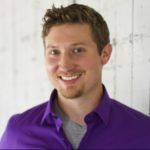 Kerry Ann at the cookingtf blog is convinced that if you have gut issues, it is recommended that you not eat ferments with mold. Something like a Pickl-it or Harsh crock are effective at preventing mold. I have also heard that the amount of salt used in fermenting does matter, as too little will not be effective at inhibiting bad bacteria, and too much will inhibit the good guys. I have not experimented with it much myself to test that, as I usually just use a 2% brine in most of the ferments I do, but thought I’d share what I read from experienced fermenters. Here’s a question. Since I have thyroid issues and cabbage is out and leaky gut, so yoghurt is out and since Braggs Apple Cider Vinegar is double fermented, can one use this instead of the SCD Yoghurt or Saurkraut? Hi, this looks really good – just started SCD yoghurt with cow’s milk and it seems to go down *ok*, but wouldn’t mind giving sauerkraut a go. One question I do have is regarding hygeine. Like with the SCD yoghurt – heating the milk kills any bad bacteria before fermenting. Is there the need for any similar process with sauerkraut? Is there a chance of bad bacteria getting into the fermentation process and creating a potentially dangerous food? Hi guys! Thank you so much for all the info you are constantly helping us with. I thought I might chip in with what I’ve learned in making sauerkraut. The first time I made sauerkraut I used Mercola’s recipe from one of his books, but it was way too salty and I didn’t even understand what went wrong. It tasted kind of like metal. Then after reading other people’s recipes & experiences online I figured out that others were using only half the amount of salt. So I now use about 1 Tbsp. per head of cabbage (instead of 2). I also use the Body Ecology Veggie Culture starter – 1 packet for 2 large heads of cabbage and I pack it into three 32-oz Wide mouth Mason jars. My local heath food store sells organic cabbage for $2 a head, so it’s cheap to experiment. I tried adding carrots to one batch and didn’t really like the fermented carrot taste (until it had been in the fridge for 6 months – then it was better). It’s really true that it tastes better with age, so if you have room to store it, make a few to try at different ages. We’ve been making it like you’ve shown but recently heard of the difference between pickling and fermenting where pickling can irritate the gut lining. I was wondering if a starter (such as 24 hour yogurt or kefir) needs to be used to ensure it is truly fermented and not just pickled. Little bit confused about the difference and hesitant to keep giving it to our sensitive kids if it may be irritating. Thanks for any clarification. That’s a useful point Jackie thanks, I think my first attempt is more of a pickle than a fermented sauerkraut! I can’t eat cabbage (because of thyroid) . Have you tried carrots or beets ? One thing I like about this website is that stuff which is left unanswered or vague in BTVC (and I understand why Elaine did that) is clearly stated and outlined in a step-by-step fashion by you guys. It tickles my analytical heart no end. Thank you for the effort. After fermenting, do you eat the juice or the vegetable or both. Which has the good bacteria. Yes, I try and mix the brine in with the veggie. It’s very powerful, so some people have to ramp up slowly. I am interested in making this sauerkraut for the health benefits. I was wondering, though, does it lose the probiotics benefit if you warm it up a little to eat it? I don’t know if I would like cold sauerkraut!! In theory, yes warming it up will kill the beneficial bacteria. Once the sauerkraught is ready to eat, how long does it keep on the refrigerator? @Judy – I’ve read that it can keep for months… so I wouldn’t too much about it. Forgot about this sauerkraut, it’s been sitting for a week and a day, it might have been a bit on the cold side where it was sitting. Am wondering what it is suppose to taste like. This just tastes like salty cabbage. Also do I destroy the probiotics if I heat it up? Hi Marlene, it will destroy the bacteria if you head it up. Keep testing it, you might see what it tastes like at 10 days and see if that’s better for you. It really depends on temperature. I’ve had some taste better at 10 days and 14 days in the winter. @Marlene – You will destroy the probiotics if you heat it up. It should taste sour, a bit crunchy and slightly bubbly. The first time I tried this it came out perfectly, smelling and tasting exactly like some of the raw organic kimchi/sauerkraut I’ve bought in stores. This time I let it ferment until after the bubbling stopped (about a week) and it just looks like cole slaw, and doesn’t smell exactly right either. Any clue what happened? Hi Steven, not sure. Could be one day it got too hot? It’s tough man, it took me about 5 tries before I got it right everytime. I had to find a different place to put it in my kitchen that was a little cooler, away from the stove. Keep trying and you’ll get it. SOLUTION: For those of us with cold homes, use your yogurt maker to ferment anything! Keep it at “room temp” with a light dimmer switch. Hey guys….I have def. 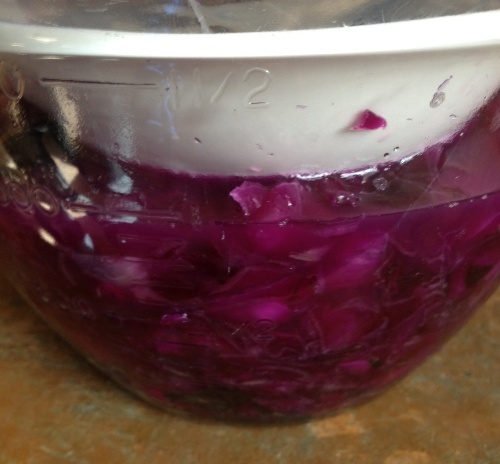 leaky gut…cant do any of the four horsement without inflammation kickin in….so I tried sauerkraut…and its just too fiberous…as are other harsh veggies…so I was wondering…have you heard of just drinking the brine and not eating the cabbage? Would you get a lot of good bugs from that? Hi Bobby Jay, yes I have heard of just drinking the brine. It will have all the beneficial probiotics in it as well, so it will help. Some people have to drink it for months before they can tolerate the actual veggie. 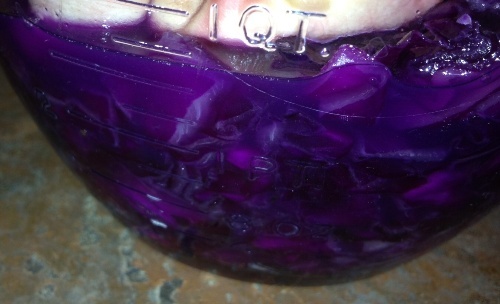 I made some sauerkraut last week and day 7 of fermenting would have been yesterday. I tasted it to see how it was and it’s really salty. Is that normal? Does it need to ferment longer or is this how it’s supposed to taste? I”ve never had sauerkraut before so I have no idea what it should taste like. I let it ferment in a downstairs bedroom and maybe it wasn’t warm enough? Not sure what I should do–any help would be greatly appreciated. Thanks! It does taste salty – but you can use less next time if you don’t like the taste. It does take longer to ferment in lower temperatures. If your basement is say 60 degrees F, you may need to let it ferment for 10-days and try it then. can you use too much salt in making it? I don’t think so. It’s a “salt to taste” thing – so using too much would probably just make it taste bad. I haven’t seen anything to suggest it would mess with the fermentation process. I learned the hard way that too much salt can make your kraut turn pink. I don’t know if it’s a bad thing though. It just looks weird and doesn’t taste very good. The lady who taught me, told me to dump half of the brine, rinse off half of the kraut and put it back in your container, then refolace the removed brine with chlorine free water to cover the kraut. Ack up and then let it sit for 3 days then taste it, every day till it tastes right. If it’s still too salty you can redo that replacement process. would this suffice for digestive enzymes also since its not cooked? @blackbass You can try sauerkraut whenever your ready for a change. It’s usually a good idea to be in your “feel good zone” where you will know exactly how you react to it, but sometimes that isn’t possible. No – it won’t take the place of enzymes, only possibly probiotics. How far into the diet should I wait to add this sauerkraut? Can I add it right away as a way of adding probiotics? Or wait until more healing has taken place? Just tried this out last week and it worked really well! I used organic cabbage the second time and it seemed to juice up better. Thanks for the post! Hi, Jordan! Great recipe. I have a sea salt that includes fluorine and iodine. Is it Ok to use it? My family has been making a similar sauerkraut (although with kosher salt and sugar) for generations! We use a full size stone crock (1 bushel of white cabbage yields 18 quarts finished product) and add small cheesecloth bags of caraway seed for flavoring. Traditionally, the top is weighted down with a large, flat stone from Lake Superior set on a clean glass plate, then covered with a clean linen cloth. Starting on the second day, and every day thereafter, we poke holes in the mixture all the way to the bottom to aerate the mixture for 10-30 minutes, then press down again and recover. It’s done in about a week, and keeps well in glass jars in the fridge. I haven’t made this in years, but will now try it without the sugar. I’d love to have a large flat stone from Lake Superior to weigh down my shredded cabbage, that’s awesome. 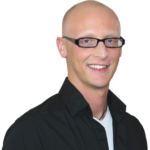 I would love to have your recipe for the sauerkraut….I am from Michigan too! I have to stone crock, I like the idea of cheesecloth bags the flavoring, & the weighting it down with a flat stone. You can use the glass jar to start with insead of the bowl. 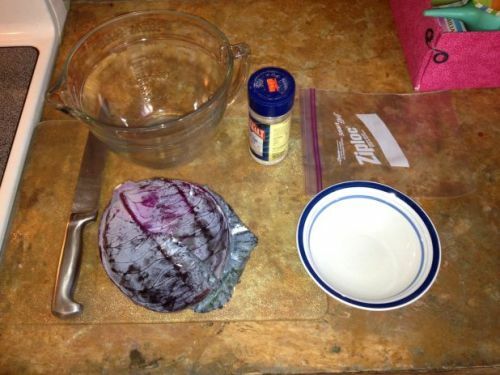 Then insead of using the bowl with baggie on top, just use the ziplock with salt water in it. Use salt water in the baggie, just in case it springs a leak. Every day or two you will want to remove the ziplock bag and rinse off any scum or residue that may develop. 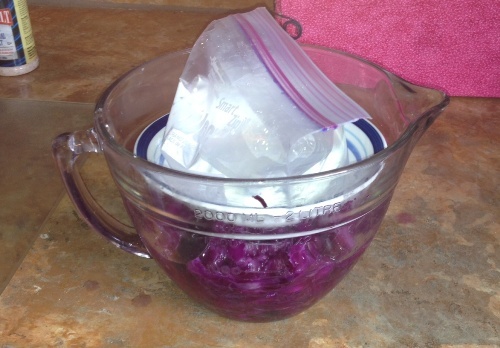 When replacing the bag, make sure that it forms a seal over the cabbage brine with no air bubbles. This should eliminate any mold from forming and wasted cabbage, also no need to transfer the cabbage to a storage container when it is done, just put in the fridge! Hi Keri, I tried making it straight into a jar and it didn’t work so I am going to try and follow your tips next time 🙂 So you’re saying you have a jar, leave the lid off and put the ziploc bag with water in on to of the cabbage…so no jar lid?